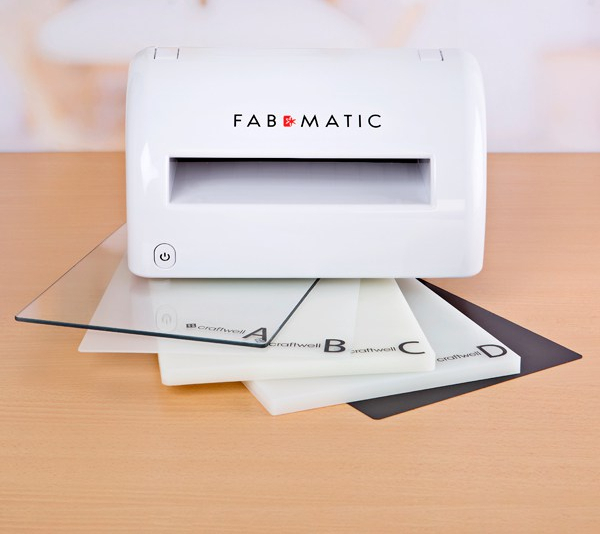 The Fabmatic is a fully automatic die-cutting and embossing machine, perfect for quilting, cardmaking, scrapbooking, embossing, home décor and more! Designed with practicality in mind, this machine is compact and portable, meaning you can craft with it wherever you go. It is fully automatic and electric. It’s robust enough to cut through vinyl, paper, mirror card, cotton, leather, canvas, silk, thin wood, thin metal, chipboard, foam, grunge paper, mesh wire screen and most types of fabrics. Suitable for crafters of all skill levels, it is quick and easy to use thanks to it being fully automatic; all you have to do is press the button and watch it go! Thanks to the automatic reversal feature, it protects the machine against wrong platform combination or too thick of a material being cut. It also comes with all the necessary elements to complete the machine. You will receive two platforms, two base platforms, a magnetic shim a user manual and a power adaptor. The machine accepts project sizes up to 8.5″ x 12″. High quality, professional internal parts built to last. Powers off automatically if not in use for a certain length of time. Safety sensors make it safe for all ages (will not start without correct thickness of platform combination. Cut multiple layers of fabric in one pass. Note: The machine itself does not contain blades to cut. All cutting is dependent on the quality of the die. For thicker materials such as leather, we encourage using a steel rule cutting die. The blades of the cutting die must be tall enough to match the thickness of the material being cut.